Recuva is a free Windows program that is able to recreate files, which has been accidentally deleted from your computer. 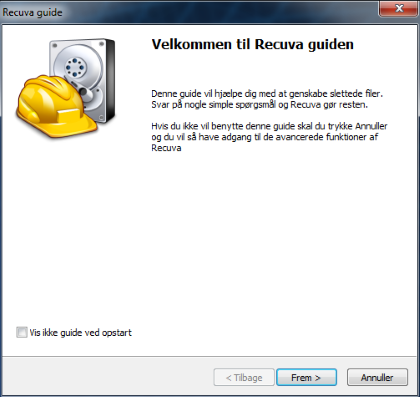 On This page You can download the Program Recuva Free , which helps you restore data . With Recuva , you can easily and easily recover deleted files on your Comps. Read and get an insight into how this smart tool works. Why download a Program like Recuva ? Have you tried to empty the trash on your computer while it actually contained an important file that could not be deleted? It's an annoying situation, which most unfortunately has occurred. What exactly do you do when you accidentally delete an important file from your computer? It is precisely in such a situation that you can benefit greatly from a recuva utility. When downloading new software, it is very important that the installation process takes place without any problems. 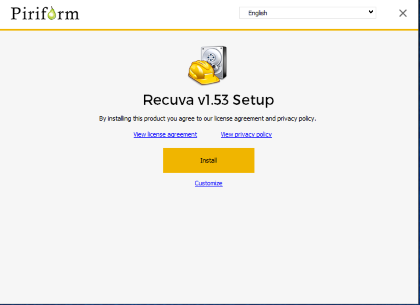 Piriform, the manufacturer of Recuva, has made sure that you can quickly and easily download Recuva on your computer. You will be guided throughout the entire installation process so that it becomes clear to you. Before downloading new software, it is of course important that you know if the application is compatible with the operating system your computer has. The Recuva utility is compatible with Windows, and is a Program that has been in existence on the market for many years. If you are able to download the application, you are therefore sure to get a decent piece of software for your Windows computer. You can also read a little more about the Program on the manufacturer's official website. How does The utility Recuva? Recuva is a Program with few but very effective features. These features let you quickly learn to navigate in. The Program will help you throughout the process - from start to finish. When you open Recuva, you will be asked to answer a few things about scanning your computer so that the Program knows what to look for. You will, among other things, be asked for file location, as shown below. If you are unsure where your files are, you can mark the 'I'm not sure' field, and Recuva will search everywhere on your computer. Once you've followed Recuva's guide, the Program can start searching for your files so they can be restored. If you are interested in the Program to do a deeper scan, you can mark the field 'Enable Deep Scan'. A deeper scan will typically take a little longer than a normal scan. Once you have tried to use Recuva a couple of times, it may be that you do not feel there is a need to be guided throughout the process. Therefore, you can choose not to display a guide at startup when you open Recuva. Then the Program will start scanning your computer immediately. A regular scan of your computer with Recuva typically takes only one par minutes. You can follow the development of the scan through the box that will appear when you start scanning. Once a scan of your computer is complete, you will see an overview of all found files. Then you can tap the files that you want the Program to restore. 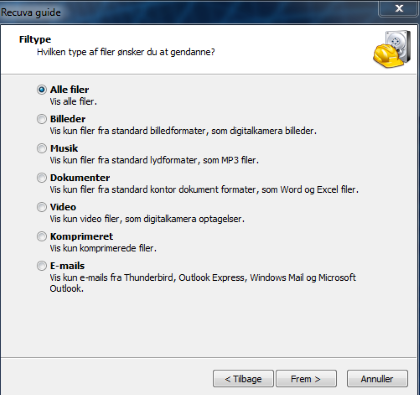 Recuva can restore a variety of file types. Including Office documents, images, video files, music, emails and more. In addition, the Program supports a variety of file systems, and Recuva is also able to recover files that have been deleted by defective software or hardware. 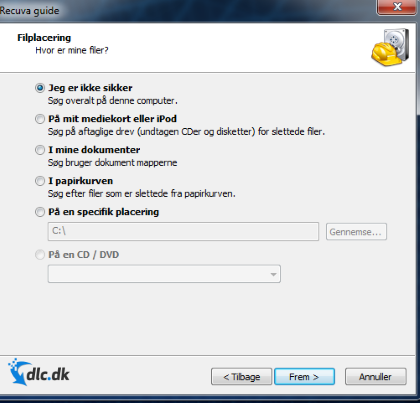 For example, when you have scanned your computer, you will most often be interested in recovering the important files as quickly as possible. 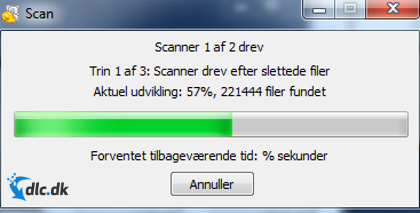 If you are interested in getting more information about your files, you can choose to change the display of the result of your scan to advanced mode. Here you can, for example, get more information about the file and a preview of a particular file. Ease of use is of great importance to the overall user experience of a Program. Recuva is designed to enable even inexperienced users to make use of the Program. The Program has a clear layout and it is very easy to navigate. In addition, the Program is available in Danish. Even though a Program is user-friendly, there may still be situations where you want questions about the Program. When you open Recuva, tap Online help at the bottom left corner of the user interface. Then you will be directed to the developer's official website, where you can, inter alia, get help with the use of the Program and get answers to the most frequently asked questions. When it comes to Programs that deal with data recovery, there are many options available on the market. Disk Doctors' Undelete is an example of a good alternative to Recuva. The Program will also find and restore deleted files on your computer. You can try a Free demo of the Program through our site. Another example of an alternative to Recuva is DiskDigger. DiskDigger can also track lost, corrupted or deleted data that you want to restore. The Program scans your computer very carefully to find the files you are looking for. 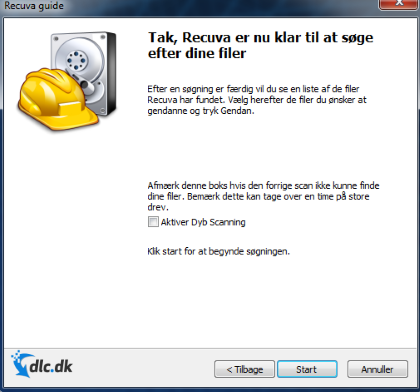 DiskDigger is also a Free utility that you can download via our site. If you are interested in reading more about other software that can help you restore data, we would highly recommend you to visit the link. Here we collect reviews of the most popular Programs and software that help you restore data to your computer. 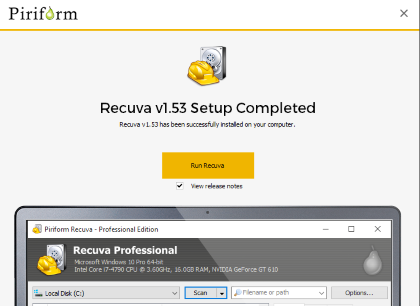 Can we recommend you to download the Recuva Program? The short answer is yes. The Program is an effective tool that allows you to easily recover deleted data on your computer. The installation process, scan and restore of files is done in a clear way. The Recuva Program is thus developed for, aYou can quickly restore files that you accidentally deleted. Revuca can also restore a variety of file types - videos, images, office documents and more. If you own a Windows computer, then we can warmly recommend you to download the Recuva Program. Find Recuva, mark it and choose "Uninstall"
Should Recuva has been damaged or corrupted and thereby difficult to remove we can recommend you finding help to uninstall it here.